The media can't get enough of the story. But investors don't seem to think it impacts the stock's value. Sometimes, sensational headlines about a company can move its stock price. And probably more often than not, they do -- even if the news has no impact on a company's long-term performance. But other times, media coverage of a publicly traded company can be disconnected enough from being relevant to the stock's intrinsic value that even dramatic headlines won't budge shares. This is the case with the June 30 news from Tesla Motors (NASDAQ: TSLA) that the National Highway Traffic Safety Administration (NHTSA) opened a preliminary evaluation in the performance of Autopilot during a fatal crash that occurred in a Model S.
It was tragic news. But investor opinion of Tesla stock appeared unmoved. Tesla stock actually moved higher in the first trading day following the after-market news about Autopilot's use during the fatal Model S crash. 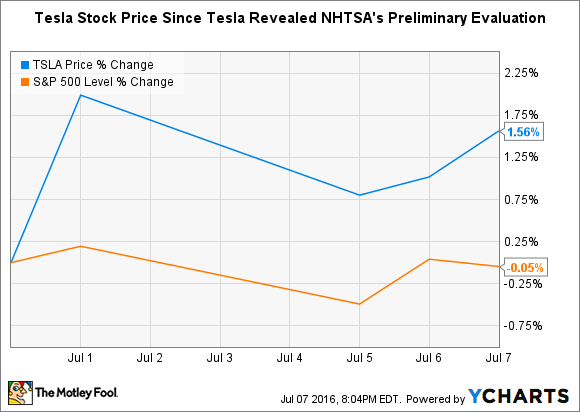 And shares even outperformed the S&P 500 during the broader period between the announcement and market close on July 7 -- even as the media proceeded to question the way Tesla handled the tragic event. In case you missed it (but you probably didn't), here's a quick summary of the scrutiny into Tesla's autopilot system that mounted during the last week. On June 30, Tesla publicly said that Autopilot was activated during a fatal Model S accident, and the NHTSA had started a preliminary evaluation of Autopilot's function during the crash. News about the event spread like wildfire. On July 5, Fortune published an article that arguably led to even more media coverage. Former Fortune Editor-at-Large Carol Loomis argued that the news was material, and should have been disclosed before Tesla's stock offering, which occurred after the crash. But Tesla CEO Elon Musk disagreed, saying the fact that the stock actually moved higher after it publicly disclosed Autopilot was activated during the crash proves investors viewed the news as immaterial. A follow-up article from Fortune on July 6 asserted the company specifically stated in a recent SEC filing that a crash involving autopilot would, indeed, be material. The same day, Reuters reported that the NHTSA was also looking into a recent crash that occurred in a Tesla Model X to see whether Autopilot was involved. On the evening of July 6, Tesla responded to Fortune in a blog post, asserting the media outlet mischaracterized Tesla's SEC filing by only referencing the excerpts that helped its argument. Further, Tesla argued that Fortune's reporting failed to capture exactly what Tesla knew about the crash, and when. While the showdown between Fortune and Tesla sparked massive, global news coverage, investors seemed to file the tragic fatal crash, along with the Model X crash, into the "market noise" file, where news that is immaterial to the long-term investing thesis goes. So far, the fatality rate while Autopilot is activated is lower than the national fatality rate in all vehicles on a per-mile basis. Autopilot is clearly marketed as a beta technology, and is even disabled by default. Tesla explicitly insists Autopilot is meant for drivers to keep their hands on the wheel, and be ready to take control, passing the responsibility on to the driver. Tesla vehicles even clearly instruct drivers to keep their hands on the wheel every time Autopilot is activated. Of course, this isn't the first time the NHTSA has looked into potential problems with Tesla vehicles, and the media subsequently devoured the opportunity for a story. In 2013, several Model S fires in a row sparked major global news coverage. While Tesla responded with an over-the-air software update that increased the default ground clearance of Model S at highway speeds, and a retrofit of a titanium underbody shield to prevent penetration of the vehicle's battery from debris underneath the car, Tesla has moved on without a hitch -- and the retrofit's cost to Tesla was too small to matter. Meanwhile, the media has mostly lost interest in Tesla fires, which occur far less than in internal-combustion vehicles hauling around their tanks of highly flammable liquid. Tesla investors can at least rest assured by the fact that there has only been one fatality in 130 million miles of Autopilot-activated driving in Tesla vehicles; yet the national average for vehicle accident fatalities is one in every 94 million miles. Sure, this might not be a game-changing start for Autopilot, but it's good enough to suggest that Tesla could be on to something good -- something that could potentially save many lives -- as the electric-car maker continues to improve this nascent technology.